The statue of Leif Eriksson on Commonwealth Avenue in Boston. 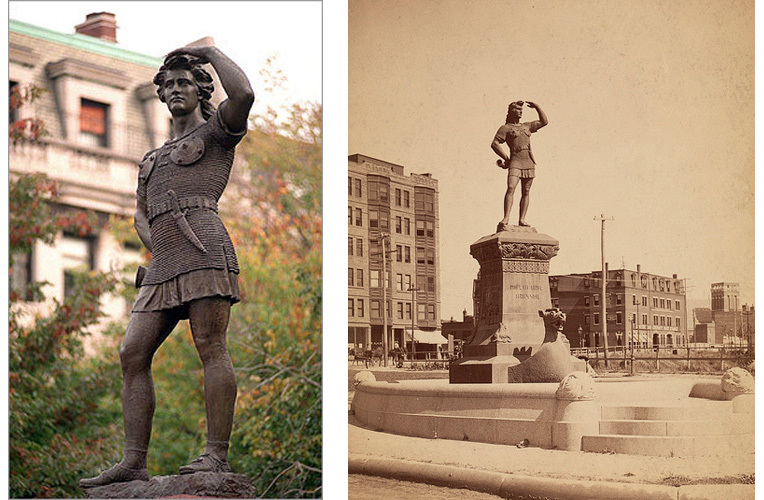 The historic image on the right shows the statue shortly after it was unveiled in 1887. At the far western end of the Commonwealth Avenue promenade, Leif Eriksson stands, shading his eyes with his hand, surveying the Charlesgate flyover. He used to have a better view. When Lief was put there in 1887, he could actually see the river, and beyond it, the New World. But why Leif Eriksson, and why there? The Commonwealth Avenue boulevard was the bastion of upper-class Boston respectability. The statues along its path were the establishment pantheon – soldiers, statesmen and clergymen – whose public service the city gratefully immortalized along one of its most fashionable and affluent avenues. Leif, in contrast, facing away and standing with his back to his fellows, bore no close relation to Brahmin society – or did he? The idea of placing a statue of Leif Eriksson on Commonwealth Avenue was first suggested in 1877. The inspiration seems to have come from Ole Bull, the great Norwegian violinist and purveyor of Norse culture. Bull was an immensely popular performer with good connections among the Boston elite, among them Henry Wadsworth Longfellow. Bull was also a proponent of the theory, first put forward by Danish scholar Carl Christian Rafn, that the legendary Vinland of the Viking sagas was in New England, and that the first European to reach our shores was Leif Eriksson in 1000 AD. Longfellow was also a believer in Rafn’s theory, about which he wrote the poem “The Skeleton in Armor,” among others of similar inspiration. Bull visited Boston in 1870 and stayed in Longfellow’s Cambridge home. A plan for erecting the statue was made over dinner one night by Bull, Longfellow, and Longfellow’s brother- in-law, Thomas Gold Appleton. 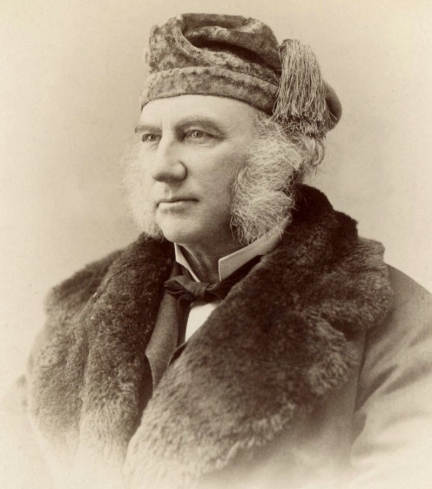 Appleton – a cultural philanthropist, amateur painter and sometime poet – gathered a committee of 52 prominent Boston citizens, including among them the Reverend Edward Everett Hale (grandnephew of Nathan Hale and the author of “The Man Without a Country”), the poet James Russell Lowell, Harvard President Charles Eliot, publisher James Fields (Ticknor and Fields) and Needham’s own William Emerson Baker. The commission to create the statue was given to John Quincy Adams Ward of New York, the most prominent sculptor in America at the time. Ward is best known for the statue of George Washington outside Federal Hall in New York, and the Ether Monument in the Boston Public Garden. The Appleton committee knew exactly what it wanted, and furnished Ward with full instructions, describing the figure and dress in excruciating detail, and even providing a picture of a bearskin-draped warrior taken from the frontispiece of Faded Leaves, one of Appleton’s own volumes of poetry, as a guide. An illustration of a Viking warrior from Thomas Gold Appleton’s “Faded Leaves.” John Quincy Adams Ward used this illustration when designing his model of the proposed Leif statue. 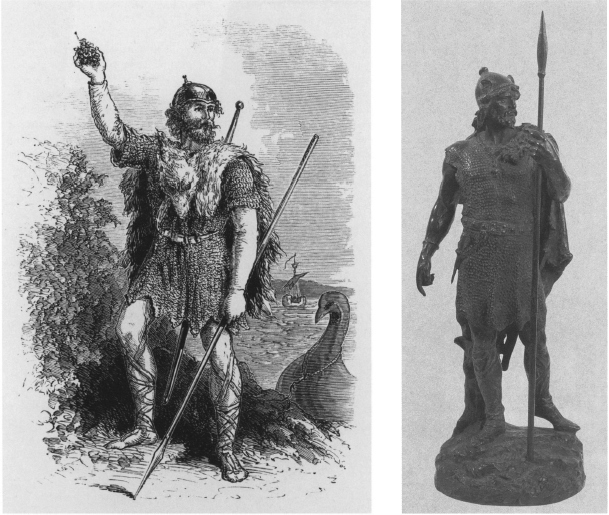 Ward completed a model for his sculpture, a rugged Viking warrior in the heroic mold, in accord with Appleton’s description. 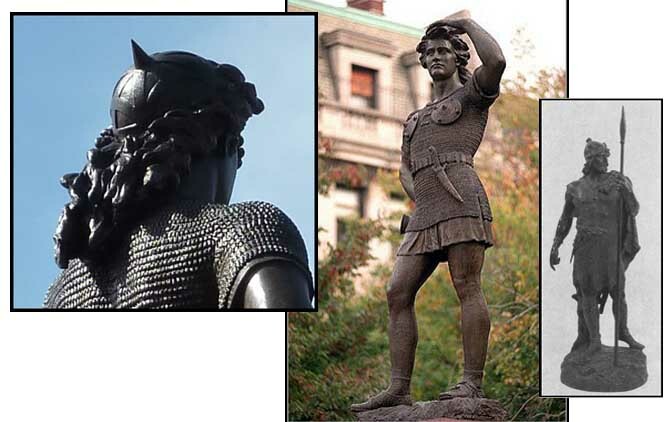 But the statue was never made, apparently because of opposition from the Massachusetts Horticultural Society, which felt that there was insufficient evidence to support the claim of the Norse discovery of America. Then with the deaths of Appleton, Bull and Longfellow all in the next few years, the project rapidly lost steam. The project was revived a few years later by Harvard Professor Eben Norton Horsford. Horsford was a chemist – specifically, the Rumford Professor of the Application of Science to the Useful Arts.. Horsford was also the inventor of Double-Acting Baking Powder. He co-founded the Rumford Chemical Works in Providence RI, producing several chemical products which were marketed under the trade name Rumford. Now, what’s so great about double-acting baking powder? What does ‘double-acting’ mean? Old baking powder – single-acting baking powder – fizzes in the presence of liquid. Housewives generally made it themselves out of baking soda and cream of tartar. It fizzed out rapidly, mostly during the mixing stage, and so had to be used very quickly. It had a very short shelf life, since dampness and humidity affected it, so it had to be mixed up every time. And every time you mixed it, it was different – so it was also unreliable. Double-acting balking powder was single-acting baking powder with the addition of sodium aluminum sulphate, which fizzed in the presence of heat. It had a better leavening action because it was twice as fizzy. And it was shelf stable, because any damage caused by damp was recovered when the batter was heated. PLUS, Rumford’s packaged it in the convenient red can, so all you had to do was spoon it out. Why, you may wonder, was this important? First and foremost, Rumford baking powder was a convenience product – one of the first. It was more reliable and it saved people time. Also, the mid-19th century was a very mobile period in American history. People were moving west by both railroad and wagon, and they had to carry everything with them. A convenient and reliable leavening agent saved them from thousands of miles of eating hardtack. Rumford’s Double-Acting Baking Powder was also used by the army during the Civil War and while patrolling the Western Territories. An army, as no less an authority than Napoleon reminds us, marches on its stomach. Much of Horsford’s research during the Civil War years focused on ways to improve the freshness, efficiency and nutritional value of marching rations for the army. Then, as now, military contracts were a lucrative business. Rumford Double-Acting Balking Powder was an immensely successful product, and Horsford became indecently rich on the proceeds. How did Horsford become involved with this project? Horsford lived on Brattle Street in Cambridge, a neighbor in fact, of Henry Wadsworth Longfellow, and at Longfellow’s house he met the violinist Ole Bull. Through Bull, Horsford became interested in Rafn’s Leif Eriksson theory, and was one of the members of Appleton’s committee to promote the erection of the Leif Eriksson statue. Also, by the 1870s, Horsford had left Harvard, and sold off his share in Rumford’s to his business partner, leaving him with unlimited time and unlimited money. “Norumbega et Virginie” by Flemish cartographer Cornelius van Wytfliet, 1597. The city of Norumbega is shown in the upper left quadrant. 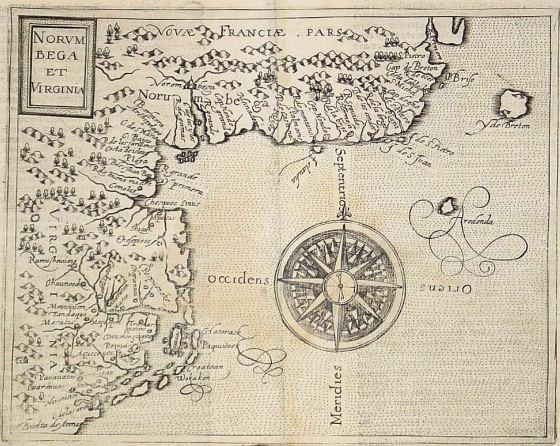 Studying these old maps and tales, Horsford became convinced that Norumbega and Vinland were the same, and that Ingram was correct when he located it in Boston. The name Norumbega, Horsford explained, was a Native American corruption of Norvege, Norway. As Horsford envisioned it, nearly 10,000 Norsemen eventually settled along the lower reaches of the Charles River, building cities, wharves, forts, canals and churches. They stayed for 350 years, mostly producing goods they could trade back home – fish, furs, agricultural produce, and especially something he called “masur-wood”, oak burls that could be carved into bowls. Horsford conducted small excavations near his home in Cambridge in an attempt to locate the original dwelling place of Leif Eriksson. He did succeed in finding some stone house foundations, but the only artifacts in them were of the American colonial period. Rather than taking this for proof that the houses were in fact colonial, he dismissed the artifacts as trash from a later period, and declared that he had found Leif’s house. He then marked the site with a granite plaque. The site of the plaque lies alongside Mt Auburn Street, at its junction with Fresh Pond Parkway to the right and Gerry’s Landing Road to the left, on the grounds of the Mt Auburn Hospital. The granite plaque at the intersection of Mount Auburn Street and Gerry’s Landing Road, Cambridge, purportedly marking the location of Leif Eriksson’s house. In 1890, Horsford claimed that he found Norumbega itself on the banks of the Charles near Weston. Horsford described finding the fort of Norumbega: “When I had eliminated every doubt of the locality that I could find, I drove with a friend through a region I had never visited, of a topography of which I knew nothing, nine miles away, directly to the remains of the fort…I had predicted the finding of Fort Norumbega at a particular spot. I went to the spot and found it. No test of the genuineness of scientific deduction is regarded as superior to this.” What Horsford in fact found was a thin scatter of rocks in a fairly rocky terrain. There was no proof – no artifacts, or the remains of buildings or wharves or any of the tons of debris that an archaeologist would expect to find from a city of 10,000. 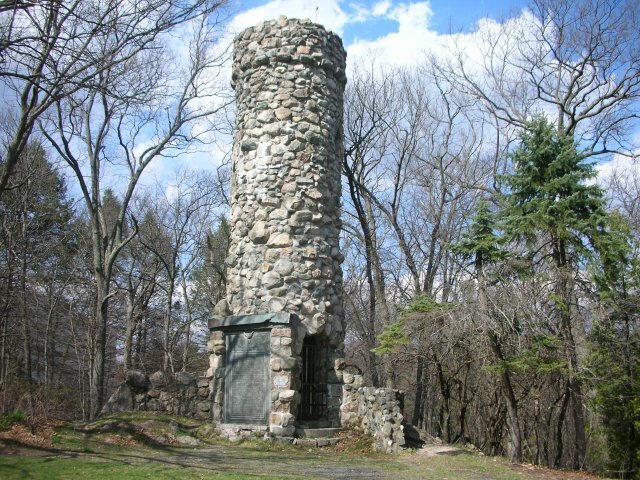 Nevertheless, Horsford declared himself vindicated and built the Norumbega Tower on the site, insetting a large plaque that summarized his theories of the Viking occupation. The Norumbega Tower in Weston. Horsford had the Tower built in the 1890s to mark the site of Norumbega. The large plaque on the side outlines his theories of the Viking settlement. Norumbega Tower lent its name to the famous attraction, Norumbega Park. The Park was right across the river from the Tower, on the Auburdale side, and was built about the same time, in 1897. Norumbega Park was the brainchild of the Commonwealth Avenue Street Railway Company; like Revere Beach, the Park was built at the end of the line to encourage people to use the trolley. The Park was hugely popular – hundreds of thousands of people came out every summer for canoeing, picnics, the penny arcade, carousel, restaurants and other attractions. In its heyday, it was the most heavily canoed stretch of water on earth. The increase in car ownership caused its decline after the War, and it finally closed in 1964. The City of Newton now maintains a parcel as the Norumbega Park Conservation Lands, but the rest is now the site of the Newton Marriot. Horsford was also involved with another spurious Viking artifact. Through Ole Bull’s intervention, he also became interested in Dighton Rock. Dighton Rock is a large, flat sided boulder in the Taunton River, down near Fall River. One side of the rock is inscribed with pictographs. 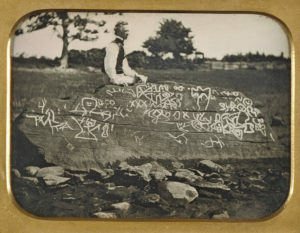 Seth Eastman at Dighton Rock, 1853. Eastman (1808-1875) was an army officer and skilled artist. In the 1850s he was on detail with the Office of Indian Affairs, and was commissioned to prepare illustrations for Henry Rowe Schoolcraftsʹ “Historical and Statistical Information Respecting the History, Condition and Prospects of the Indian Tribes of the United States.” The markings were filled with chalk to make them more visible in the daguerreotype. The unusual images on Dighton Rock have attracted attention since the first English settlers came to this area. The first copy of the inscription dates to about 1680, and numerous copies were made in the 17th, 18th and 19th centuries. Prevailing opinion among the learned was that the inscription was very old, and no doubt had something to do with the Indians. One copy was even shown to George Washington, who remarked that it looked a great deal like the Indian markings that he used to see as a young man surveying in Virginia. Not until Carl Christian Rafn came along with his Vinland theory was the Dighton Rock inscription associated with Vikings. Rafn translated the inscription to read: “Thorfinn and his 151 companions took possession of this land”. (As recorded in Erik’s Saga, Lief’s lieutenant, Thorfinn Karlsefni, voyaged to Vinland with a fleet of three ships to establish a settlement a few years after Lief’s discovery). Top: Stephen Sewell’s tracing of the Dighton Rock inscription, 1768. This is one of the earliest copies known, and is generally considered to be accurate when compared to the Eastman photograph. 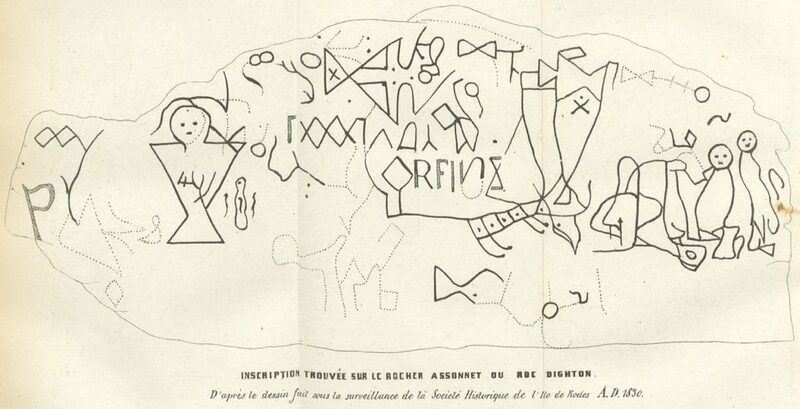 Bottom: Carl Christian Rafn’s sketch of the Dighton Rock inscription, 1830. Note how the lines above the “deer” figure (lower center) have been altered to read “…orfin…”, a fragment of the name “Thorfinn.” Note also that this purported inscription is in Roman letters and not Viking runes. The violinist Ole Bull, being a strong proponent of Rafn’s Vinland theory, convinced a Norwegian businessman in Fall River named Neils Arnsen to buy the Dighton Rock and the land it sat on. Arnsen did so, and later gave it to the Royal Society of Antiquarians in Copenhagen. The Royal Society quickly deeded it back as a gift to the Taunton Historical Society, assigning its care to a group of six trustees, among whom were Eben Horsford, Thomas Gold Appleton, the Reverend Edward Everett Hale, and William Emerson Baker. As for Dighton Rock itself, both Baker and Horsford were willing to be skeptical – even to partisan eyes, the inscription does not look very runic – but believed that it should be preserved. The Rock now resides in the Dighton Rock State Park in Berkley, MA, living its latest incarnation as a relic of Portugese exploration. Now back to Norumbega… Horsford published his Norumbega findings in seven lavishly-illustrated books and numerous articles between 1886 and 1893 – and this time the idea caught fire. Supported by Horsford’s money and the growing popularity of the Vinland theory, the Leif Eriksson statue project was again revived. The new commission went to Boston sculptor Anne Whitney. 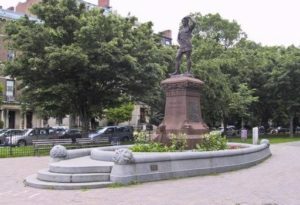 Whitney was known for her public sculptures, among them the statue of Samuel Adams that stands in front of Faneuil Hall, and the seated statue of Charles Sumner in Harvard Square. In addition to being a sculptor, Whitney was also a painter and a poet; she was passionately committed to progressive causes such as women’s suffrage and temperance. 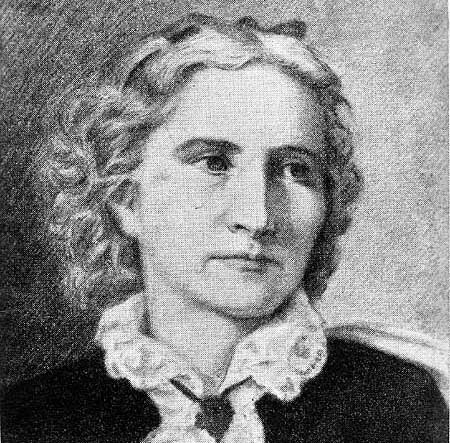 Anne Whitney was a sculptor, poet, and social activist. Among her other public statues in the area are Samuel Adams (1880) at Faneuil Hall, and Senator Charles Sumner (1900) in Harvard Square. The statue was completed in early 1887, and dedicated in the fall of that year. It stands on a pedestal of red sandstone. On the face is carved in runes – “LEIF the LUCKY, SON of ERIK;” on the back in English, “Leif the Discoverer, Son of Erik, who sailed from Iceland and landed on this continent, AD 1000.” On the left and right sides are cast reliefs of the journey, and the base of the pedestal is modeled as a ship. The whole is surrounded by a boat-shaped granite basin, which in the summer is planted with flowers, but was originally the basin of a fountain. The Leif Eriksson statue on Commonwealth Avenue. Details below show the bas-relief panels, the runic inscription, and the “prow” at the base of the pedestal. The dedication consisted of a parade from the Common to Faneuil Hall, organized by several Scandinavian fraternal organizations, and of course a great deal of speechifying by Horsford and Edward Everett Hale. Horsford praised Whitney’s statue as “vividly her own conception”, asserting that it was exactly as Appleton and Longfellow would have wanted it. 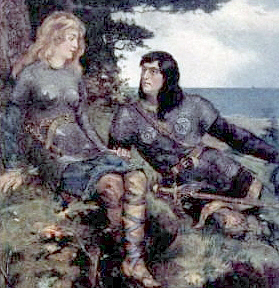 Hale elaborated on the close ties forged by Leif between the old Norse world and New England, asserting that Eriksson was the first to set eyes on the three hills of Boston. The speeches were followed by singing of the Leif Eriksson Chorus, and then the whole procession marched down Commonwealth Avenue, where Whitney pulled the cord to unveil the statue. Despite Horsford’s speech, the statue was certainly different from Appleton’s idea of a rugged adventurer. Leif is shown as a beardless young man. He strikes a casual, almost contemplative pose. There is a complete absence of bearskins, shields, spears and other warlike impedimenta. There is a spiked helmet, but so small and so placed among the flowing locks as to be virtually invisible to the viewer. The Leif Eriksson statue, with a detail showing the helmet. The Ward statue model is provided for comparison. The critics raved, praising the emphasis on the “classical ideal” over the more typically warlike and barbaric depiction of Vikings. Art critic James Jackson Jarves called him “a Norseman Apollo…a handsome vigorous fellow, whose well-modeled limbs, spirited Characteristic pose, figure-displaying armor are all calculated to win women’s hearts and men’s admiration…It is agreeable to believe that such a man as Leif was the first European to leave the impress of his footsteps on our rugged shores.” Harper’s Weekly observed that “the knit brow and noble bearing of Leif tell not only of the firm resolve and daring of the explorer, but also that he was a worthy forerunner of the Pilgrims…Miss Whitney deserves the thanks of Americans for having chosen as the type of the Northmen ancestors, not the Berserk warrior, but the Iceland merchant, explorer and Christian, as Leif Eriksson truly was.” Only the Boston Sunday Herald’s critic did question “if there is not in the limbs of her statue something of a feminine contour, a trifle too little of masculine severity and hardiness”, but happily concluded that “[this impression] was dissipated almost entirely upon a longer inspection”. In other words, for Brahmin society Leif was no longer to be portrayed as a plunderer and pillager, a son of bloody Erik the Red, but as good Christian explorer and merchant – not so very unlike their good selves. This image took hold, and all along the corridors of power in the 1890s and early 1900s the Viking motif crops up on commercial and civic architecture in Boston. Some examples of the prows of Viking ships as architectural ornaments in the Boston area. Left to right: the World Trade Center in the Seaport District, circa 1901 (courtesy of the AIA Guide to Boston, 2017); the Board of Trade Building on Broad Street, 1902; the main piers of the Longfellow Bridge at the waterline, 1906; and Harvard’s Weld Boathouse on Memorial Drive, 1906. So, Boston’s elite in their well-heeled gathering places began to identify themselves with, of all people, Leif Eriksson. Why? Because of Christopher Columbus. Prior to the 1840s, Irish immigration into Boston numbered in the range of only 4 or 5000 annually. During the famine years (1845-1850), that number rose tenfold, to around 40,000 annually. Around 1900, in part because of political instability, there was a corresponding influx of Italian Catholics into Boston. The Italian population of Boston was estimated at 5000 in 1890, and 30,000 in 1910. The Knights of Columbus was founded in 1882, and by 1892, the 400th Columbian anniversary, there was a strong movement among American Catholics to make Columbus a Saint as the bringer of Christianity to the New World. For the Protestant elite of Boston then, Leif Eriksson was the anti-Columbus. They saw him as fair and Nordic, where Columbus was Italian. Columbus brought (as they thought) superstition and slavery to the New World, while Leif brought progress and commerce. If the possibility had existed in his day, Leif was the kind of man who would certainly have been, well – Protestant, like them. And if Horsford and Bull and Rafn were to be believed, Leif Eriksson got here first. And if he got here first, then Leif Eriksson and not Columbus was the first European to set foot in the New World. And it was Leif Eriksson and not Columbus who first brought Christianity to these shores. So if you had Leif Eriksson, you didn’t need Columbus. Well, did he get here first? The answer in fact, is yes – but Vinland was not the Norumbega of Horsford’s imagination. Until the 1960s, there was no evidence at all of Norse settlement any farther west than Greenland. Greenland had two Viking settlements, the East settlement (at the southern tip) and the West Settlement on the west coast. The Norsemen who went there, however, were not looking for trade goods or “masur-wood”. Leif’s father, Erik Thorwaldsson was called Erik the Red both for his red hair, and his red hands. Erik’s own father was exiled from Norway for murder around 970 AD, and went to live in the Norse settlements in Iceland. Like father, like son – Erik was exiled from Iceland for murder in 986, heading out to the known but not settled lands to the west. Erik called the land “Greenland” for two reasons – first, the name “Ice-land” was already taken; and second, he was something of a con artist and he figured that a pleasant-sounding name would attract more settlers. Nevertheless, life in Greenland was harsh, leading the settlers to explore the surrounding regions in search of – can I say it? – greener pastures. 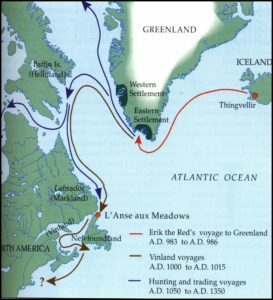 The two documents of these voyages, the Greenland Saga and Erik’s Saga describe a soft western land of meadows and grapevines, which they called Vinland. According to the Sagas, Thorfinn Karsefni and his wife, known as Gudrid the Far-Traveller, and a band of about 150 settlers followed Lief’s route a few years later and established a short-lived settlement in Vinland. Proposed routes of the Vinland voyages, based on the Norse sagas and later historical accounts. The map is taken from W. Fitzhugh and E. Ward’s book “Vikings: the North Atlantic Saga” (2000). Like the search for Norumbega, the search for Vinland had gone on for many centuries, up and down the east coast of North America. 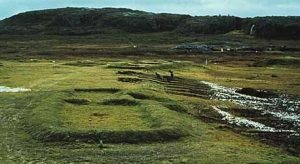 In 1960, a Norwegian historian named Helge Ingstad was told by a Newfoundland fisherman about mounds along the coast near his village of L’anse aux Meadows. The fisherman believed that the mounds were Indian burials, but Ingstad thought that the layout looked like settlements of the Viking period that he had seen in Norway. The outlines of house foundations and the reconstructed structures at the site of L’anse aux Meadows in Newfoundland. The houses and artifacts are consistent with those at Viking-period sites in Norway and Iceland. Ingstad came back the following year with his wife, the archaeologist Anne-Stine Ingstad. In the years following, they excavated a settlement of longhouses, a smithy, a carpenter’s shop, a boat-repair shop – all of which could be identified by the trash and tools found in the deposits. The most important discovery was that the artifacts – and there were lots of them – were consistent with the style and form of equivalent types of artifacts found in Norway and dated to Viking times. There were women’s tools as well – for weaving, cooking, etc – indicating that this was a full-fledged settlement and not just a fishing camp. Even so, the settlement was small – a few families – and probably short lived – several years only – before the settlers retreated again to Greenland. According to the sagas, the settlement lasted for only three years. However short-lived, there was a huge amount of material left behind – tools, food bones, ornaments, weaving tools, arrows, building timbers, burned patches in the soil from hearths and smithy fires. Compare this to the complete lack of such finds at purported sites like Horsford’s Norumbega, which was supposedly occupied for 350 years. When people live somewhere, they leave garbage; and after 350 years, there would be lots of garbage. That is really the bottom line of archaeology – no garbage, no settlement. The find of an isolated object – even one as interesting as Dighton Rock– is not sufficient to prove that there was contact. The object must reside within a context of deposits appropriate to the activity. L’anse aux Meadows was the first (and still only) significant evidence of a Norse presence in North America (though recent investigations at Point Rosee, Newfoundland, may indicate a second small settlement). L’anse aux Meadows is consistent with the settlement of Thorfinn as described in the Sagas. It is now a Canadian national park, and a designated UNESCO World Heritage Site. So, in the end, Longfellow and Ole Bull and Eben Horsford got their wish. Leif Eriksson really was the first European to set foot on these shores. But even so, Mayor Hugh O’Brien and the good Catholics of Boston got the last laugh. There is no evidence that the Norse settlement of Vinland ever totaled more than a few families, much less tens of thousands. Leif came, and then he went, and even in Norway no one remembered. Columbus came here 500 years later, and he changed the world. Nevertheless, the brief ascendancy of Leif Eriksson lives on in the fabric of Boston (if you know where to look) reminding us of a time when New England was a wilder place, and Vikings sailed the Charles. The idea for this paper was based on a topic that I first encountered as a graduate student at Harvard University, in the Department of Anthropology. I was Teaching Fellow for Professor (now emeritus) Stephen Williams, who developed a course for undergraduates on the topic he called “Fantastic Archaeology” – a survey of the various and persistent frauds, hoaxes, and plain misinterpretations that have dogged American archaeology for nearly three centuries. Case studies, such as the numerous interpretations of Dighton Rock, were used to teach students both the techniques of archaeological evaluation, and more generally the logical principles of argument and evidence. The course was immensely successful, and many colleagues now offer their own versions of the course. Williams later published a book on this topic, Fantastic Archaeology: the Wild Side of North American Prehistory (University of Pennsylvania, 1991). This article has been cited by two recent articles, and (!) a mystery novel. Carlo Rotella’s “The Ruins of Viking Boston” (Boston Globe, Op-Ed, 2 August 2010) explores the power of one man’s vision to shape the landscape, and how our built environment is an accretion of the lives and works of those who have lived here before us. Andy Woodruff posted a blog entry on cartogrammar.com about mapping Norumbega (ancient and modern). And I was surprised and pleased to see the article cited as a source in Kieran Shields’ excellent mystery novel, A Study in Revenge (2013), in which a clue to the mystery resides in the study of Eben Horsford. This article is featured as a “Special Guide” in the new edition of the AIA Guide to Boston (Boston Society of Architects, 2017). The picture of the World Trade Center Boston was used with their kind permission. Eben Horsford wrote extensively on the topic of the Norse settlement of New England. His major works include The Defenses of Norumbega (Houghton, Mifflin, 1891), The Landfall of Leif Erikson, A.D. 1000, and the Site of his Houses in Vineland (Damrell and Upham, 1892), The Discovery of the Ancient City of Norumbega (Houghton, Mifflin, 1890), and The Problem of the Northmen (Houghton, Mifflin 1890). Lest we leave you with the impression that Horsford was nothing more than a crank, it should be noted that he was a respected and distinguished chemist whose contributions to the science of food chemistry benefit us to this day. He also used his great wealth to further such causes as public health/nutrition, public education, and especially higher education for women. He was the donor of the Shelter Island (NY) Public Library. He was also a benefactor and President of the Board of Visitors of Wellesley College. Norumbega Hall (now gone, I believe) was so named in his honor. Horsford was a patron of the sculptor Anne Whitney, and a bust of Horsford was made for Wellesley College by Whitney. In 2006, the American Chemical Society designated Rumford Double-Acting Baking Powder as a National Historic Chemical Landmark, as a “seminal achievement” in the history of chemistry. Alwin and Helga in their matching armor-plated bras. Alwin is also wearing a bad wig, for reasons too complicated to explain here. Read the book. Horsford’s works were the inspiration for the delightful novels of Ottile Liljencrantz (1876-1910). Ms. Liljencrantz based her novels on Horsford’s accounts of Viking settlement in the New World. In Randvar the Songsmith, the hero (who lives in the Newport Tower, and is the son of the Viking ghost-narrator of “The Skeleton in Armor”!) travels down to the city of Norumbega to take service with the new Jarl (with unforeseen complications…). In The Vinland Champions, young Alrek follows Thorfinn, Gudrid, and the men to establish a settlement in Vinland (complications abound here, too). In The Thrall of Leif the Lucky, the young English prince Alwin, captured and sold into slavery among the Norsemen, tries to regain both freedom and status by serving Leif Eriksson. This involves the armor-plated bra so fetchingly modeled on Whitney’s Leif statue (and then it gets really complicated…) Not only are these rollicking good stories, but they show the extent to which this theory had permeated popular culture by 1900. For an exhaustive summary of research and the interpretations of Dighton Rock in the 17th -19th centuries, see Edmund Delabarre, Early Interest in Dighton Rock (John Wilson, Cambridge, 1916); The Middle Period of Dighton Rock History (Wilson, 1917) and The Recent History of Dighton Rock (Wilson, 1919). For a modern discussion of Viking exploration and discoveries in North America, see William Fitzhugh and Elizabeth Ward, eds., Vikings: the North Atlantic Saga (Smithsonian Institution / National Museum of Natural History, 2000). The map of the Greenland voyages was taken from this volume. For the discussion of the Leif Eriksson statue in the context of the cultural and ethnic politics of Boston, I am greatly indebted to Janet A. Headly, “Anne Whitney’s Leif Eriksson: A Brahmin Response to Christopher Columbus” (American Art, Summer 2003). For a brief history of Norumbega Park, see Robert Pollack, “Norumbega Park” (1999) http://www.defunctparks.com/parks/MA/norumbega/norumbegapark.htm. An excellent array of old postcards of Norumbega Park in its heyday can be viewed on the Newton History Museum‘s website exhibit, “Canoeing on the Charles”. An inventory of Leif Eriksson monuments worldwide, including the Eriksson statue, Horsford’s plaque locating Leif’s house, and the Norumbega Tower was compiled by Peter van der Krogt http://leiferiksson.vanderkrogt.net.